We are an eminent organization having plenty of experience in the manufacturing, supplying, trading and servicing Embedded Project Kits. FACTS (Flexible AC Transmission) BY TSR: The project is used to achieve static voltage compensation under FACTS using thyristor switched reactor (TSR) in shunt. This helps in lowering the voltage at the load end that may draw leading current either during charging the transmission line or during low loads. Portable Programmable Medication Reminder: The project acts as a reminder for people to take medicines in time. Keypad is used to enter the time at which the medicine is required to be taken. The real time clock (RTC) used keeps tracking the time to remind the person by a buzzer sound together with the name of the medicine on the LCD display. Density Based Traffic Signal With Remote Override In Emergency: Remote override control of density based traffic signal by emergency vehicles like ambulance, fire brigade etc for getting priority in the desired direction. Theft intimation of the vehicle over GSM BY SMS With User Programable Number Features to owner who can stop the engine remotely: Theft intimation of the vehicle over sms using GSM modem by user programmable number upon a mis-call , to the owner while unauthorized door entry is made. Owner can send command through his mobile to stop the engine by activating the relay interfaced to a microcontroller along with the GSM modem used for the purpose. Remote Password Operated Security Control By Android Applications: The micro-controller based lock indication is an access control system that allows authorized persons knowing the password only. Password is stored in another dedicated EEPROM that can be changed at any time unlike a fixed one burnt permanently on to the micro-controller through remotely operated commands to it by touch screen based user friendly GUI on any smart phone with Android applications. Home Automation By Android Application Based Remote Control: The project is designed to operate electrical loads using triacs interfaced to a microcontroller through remotely operated commands to it by touch screen based user friendly GUI on any smart phone with Android applications for loads home or office automation for optimum use of energy. 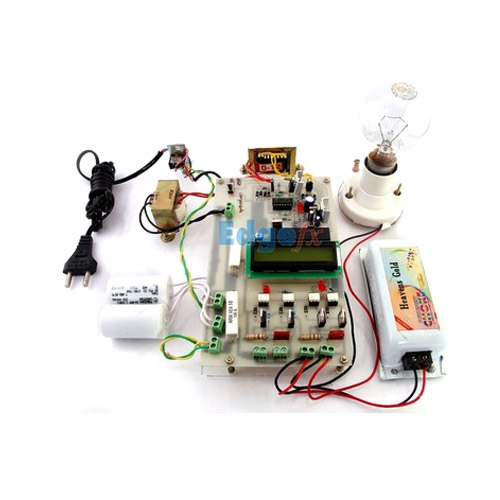 Remote Operated Domestic Appliances Control By Android Application: The project is designed to operate electrical loads using relays interfaced to a microcontroller through remotely operated commands to it by touch screen based user friendly GUI on any smart phone with Android applications. Induction Motor Protection System: The project is designed to protect an induction motor from single phasing and over temperature. It uses sensors interfaced to comparators for disconnecting the motor through a realy. The project is supplied with lamps in place of 3 phase motor for demonstration purpose.